Indoor tennis tables are a perfect way to get your family together so as to have fun and also connect with one another. It is better watching television in the evenings as it might help you to be a little fitter. The STIGA STS 520 is a top quality model that will be a great addition to a family who enjoy playing at their home and also if they love the game. This table tennis table is for home players who are serious, as it is a good-looking table. With the table you will also get the respected brand association STIGA. This table tennis has been in the market since 1944. The table comes with outstanding bats (blades or paddles) as well as ping pong rubbers. The manufacturer is always improving its products by working together with top table tennis players. The most notable thing about this table is its frame. The one-inch thick top is reinforced by a 2.5″ steel apron that offers the tennis ball an even as well as a consistent bounce on the entire table. The apron that it features is coated with powder so as to prevent scratches as well as rusting. Moreover, the apron is supported by strong heavy duty 2.5 inch legs that are made of steel. The legs feature leg levelers so as to be able to adjust to rough floors. Above all, its chassis is made using steel components and it is supported with top quality cross beams that increase the table’s rigidity. The model’s frame is designed to offer extreme stability and you’ll definitely spot the difference during an exciting game. STIGA did not skimp on the supplementary components of this tennis table. The model features silk-screened one -inch thick MDF table top as well as large five inch wheels which are excellent. This product is certainly among the best tennis tables in the market. The best thing about this table is that it has offers consistent bounce and it has no dead spots. You will notice that this tennis table is designed like a tank. When it’s completely assembled and installed, it will seem as if it is not portable. This tennis table weighs about 400 pounds and it doesn’t bend or slide throughout an aggressive game between 2 experienced players. Besides offering a frame that’s very sturdy and also durable, it has many additional features. It feature massive five -inch Mag Wheels at its ends of the table legs. . The wheels can easily roll over tile, cement, carpet, or any other uneven surface. It is therefore very easy to set up this tennis table. Moreover, the table also can be locked very easily during a game so as to offer additional stability. 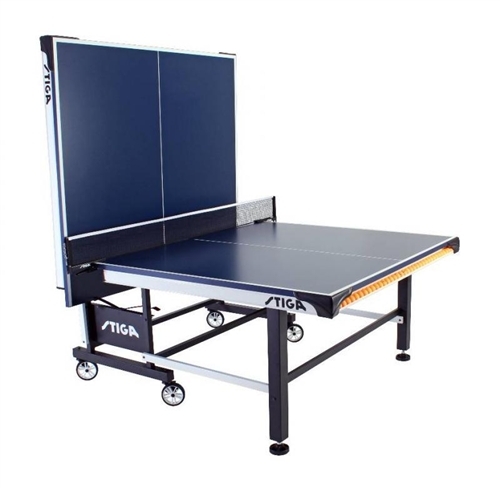 The STIGA STS 520 Table Tennis Table is great table that’s made using top quality materials. The major feature of the table is its frame that’s made using heavy duty steel. The frame offers outstanding playing experience that’s stable and it also offers a consistent bounce on entire playing surface. This tennis table is ideal for experienced players who want to practice and also play at a top level. Other than this table, there are many more STIGA ping pong table choices that you can choose from.